This is a challenge aimed at promoting the Grandvalira area through healthy physical activity. Snow and mountain activities can be dangerous. When you join a challenge your safety and that of others is the main priority. When you join and participate in a challenge you do it at your own risk. 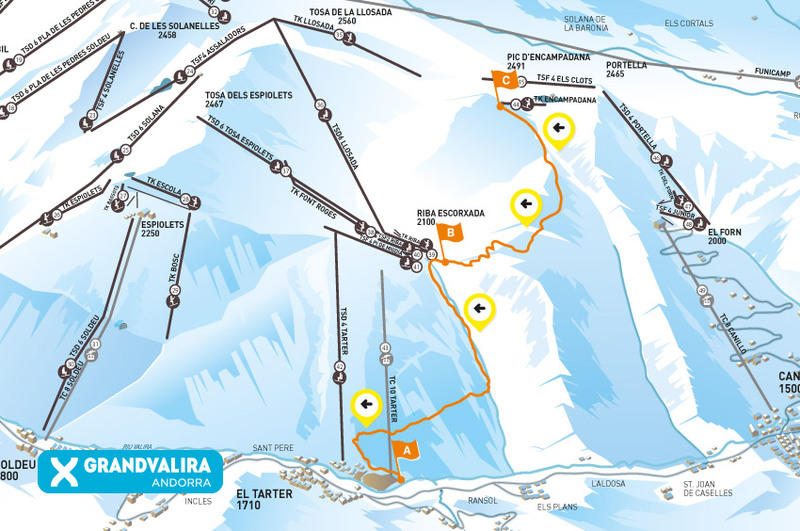 Taking part in the Grandvalira Timed Route is free and requires you to be logged in to your account at My Skitude, using the Grandvalira app. Remember, if you have a Fanatics de Grandvalira account, you can also use it to create and access your My Skitude account. The route will have an associated ranking, where each participant´s best times will always be displayed, so long as their participation has been properly recorded and synchronized. Warning! Before joining a challenge please make sure to have the latest version of the mobile app and the GPS of your device turned on. The winner is the person who registers the shortest time in each category. Leaderboards and winners are based on statistics computed by Skitude, taking GPS data from your My Skitude compatible mobile app. The synchronization of GPS tracks and photos with the Skitude Cloud and its publication in the Skitude social network takes place automatically when the device is online. We will take into account all the tracks synced with Skitude. Tracks are synced automatically by your app when you have a good enough internet connection. Once you join a challenge, only the tracks and/or pictures you upload to Skitude for the challenge validity period will be taken into account. Skitude will not be held responsible of any technical problems with the acquisition and transmission of data. Skitude will guarantee fair play by validating the results of the winner and by verifying that the data collected fulfills the challenge conditions. If Skitude considers that the data is invalid or false, a new winner will be picked applying the same criteria. Skitude reserves the right, during the challenge period, to make the validations deemed necessary and the corresponding changes in the results. HOW WILL THE WINNERS BE ANOUNCED? Winners will be notified by the email bound to their My Skitude account and will be published using the channels available in every case. WHO WILL DELIVER THE CHALLENGE PRIZES? The challenge promoter will be in charge of delivering the prizes to the challenge winners.